Aomori ramen noodles characteristically come with a soy-sauce based soup accentuated with dried or grilled sardines and fine, wavy noodles. 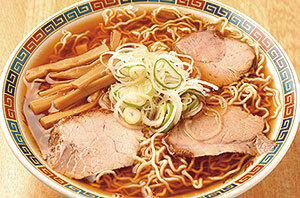 It is said that after WWII, diners and food stalls in front of Aomori Station started serving Chinese noodles. The ramen has a light flavor and therefore was eaten for breakfast and as a snack for merchants who came from all over Tsugaru. The owner of a popular ramen stall in Sapporo’s ramen street started afresh in Furukawa, Aomori City. The owner experimented with a soup base made from miso, salt, and soy sauce mixed with curry and milk, and it turned out to be very popular. After much trial and error “miso curry milk ramen” was born. 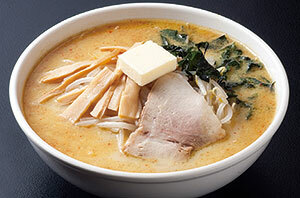 The ramen’s delicious, unique flavor comes from the combination of the richness of miso, spicy curry, mild milk, and butter. 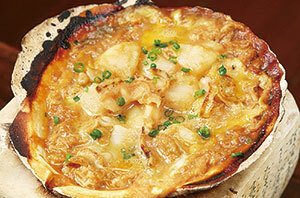 Eggs and miso are put into the shells of scallops from Mutsu Bay and grilled slowly . 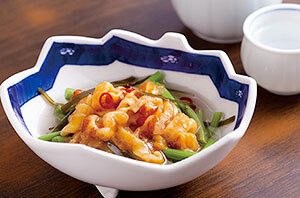 It is a simple dish but its soup is wonderfully delicious, oozing out of the shell. For those who wish to enjoy the untouched natural taste of scallops, Aomori’s chefs know just what to do. The scallop is placed on a grill, using the deeper side of the shell as a dish. 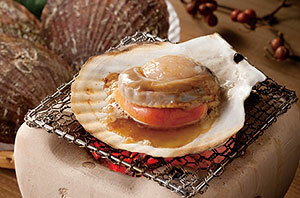 The soup from the juices produced as the scallop is grilled has an unforgettable flavor. 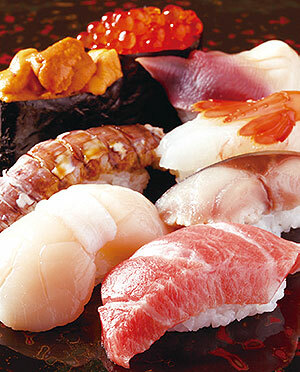 The secret to Aomori’s delicious sushi is its fertile ocean and rigorous culinary skills! Aomori produces such fantastic fresh sushi because it is surrounded by four seas: the Pacific Ocean, the Sea of Japan, the Tsugaru Strait and Mutsu Bay. Aomori is known for its great sushi, thanks to the countless sushi chefs who devote themselves to making customers happy. After WWII, during a severe winter, a woman running a food stall added ground ginger to the traditional miso soup base of oden (Japanese seafood stew), to warm the passengers boarding the Seikan Ferry as much as possible. This pleased the passengers, and the soup base became popular. 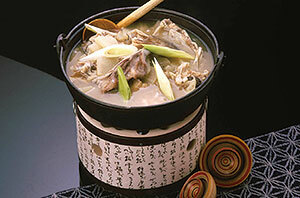 The stew contains lots of ingredients that keep the body warm, including devil’s tongue, large squares of deep-fried fish meat, chikuwa fish roll, bamboo grass shoots and whelks. Aomori’s sake attracts fans from all over Japan. It is brewed using the underground water that contains run-off from the snow of Hakkoda mountains, and Aomori’s sake rice varieties “Kojonishiki” and “Hanaomoi” which have been bred to improve the quality. 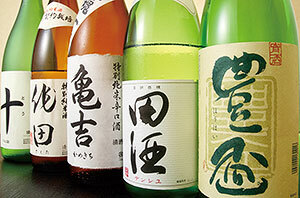 Sake is one of the products that symbolizes Aomori’s taste and culture. Hakkoda beef is grown in the peaceful environment of Hakkoda Farm, approximately 500m above sea level, surrounded by indigenous beech and Japanese oak forests. The beef is mostly red meat and is full of flavor. The fleshy meat is perfect for slow-cooked dishes. Jappa soup is one of Aomori’s coastal winter dishes, made with cod meat cooked with daikon radish, bok choy, devil’s tongue, and tofu, and flavored with miso and salt. On cold snowy nights the soup is one’s perfect companion, keeping the body warm. The edible wild plant commonly known as “mizu” (a member of the nettle family) is perfectly matched with sea squirts, and together they go very well with sake. Flavored with kombu seaweed, the crispy mizu and the sea squirt’s unique bitterness are almost addictive. 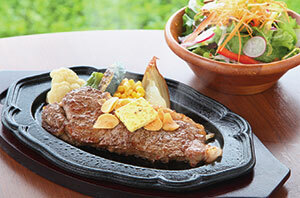 The dish makes a good accompaniment to rice, and is also enjoyed with sake. 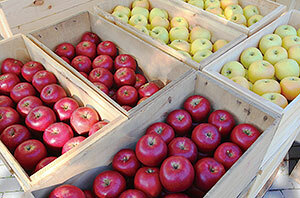 Most apples grown in Aomori are of the “Fuji” variety. They are not very acidic and are very sweet. Other varieties such as “Jonagold”, refreshingly sour and sweet apples with a crispy texture, and “Orin”, which are richly juicy and have a strong scent and sweetness, are harvested and marketed from August to November, offering a wide variety of textures and flavors in each season. 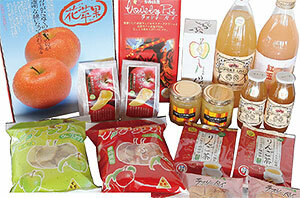 Aomori’s apples are marketed as a variety of processed products, including juice, apple pies, apple jam, and fruit cake, perfect as souvenirs from the land of apples. 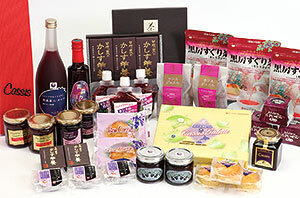 Aomori City is the largest producer of cassis in Japan. The cassis is used to make jam, cakes, juice, wine, and other products, that are enjoyed by many visitors as souvenirs. 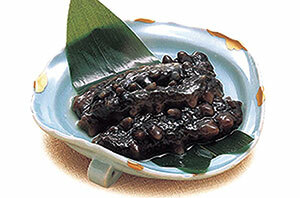 Aomori is one of the largest producers of sea cucumbers in Japan. In Aomori, sea cucumbers appear on dinner tables for New Year’s celebrations, and as a marinated dish during the cold season. 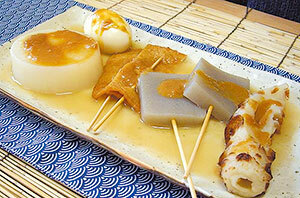 This rice cake’s name means “rice cake that is loved forever” . It originally came from Kyoto and is said to have been passed onto Aomori by merchant ships travelling around Japan. 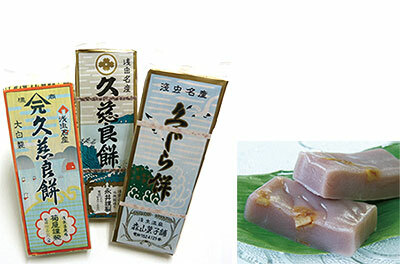 The secret of the rice cake’s enduring popularity is its flavorful walnuts and moderate sweetness.